Ex-Kerry senior Conor Cox pointed the way for the Rossies. ENDA SMITH’S LATE penalty sealed a great win for Roscommon as they put the brakes on Monaghan’s blistering start to 2019 with their first victory of the campaign at Dr Hyde Park. Last weekend Stephen O’Hanlon burst onto the scene after his introduction against the five-in-a-row chasing All-Ireland champions Dublin in Clones. But Monaghan failed to build on that 2-13 to 1-13 victory and instead and O’Hanlon got a straight red late on in an enthralling second half. 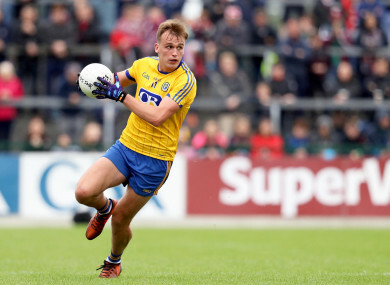 Roscommon had debutante Conor Cox and Tadgh O’Rourke black carded in the final ten minutes of normal time but they returned before the end and two late points from Cox and Ronan Daly were enough. Both teams flooded their defences in the first half but the Roscommon backs were tighter on their men and restricted the scoring opportunities. Brothers Conor and Niall Daly were immense at the heart of their rearguard effort and popped up further up field too. But Roscommon registered eight wides before half-time and they should have been further ahead than the 0-6 to 0-4 scoreline. Monaghan wing-back Dessie Ward got forward to score his side’s first point and that was cancelled out Enda Smith. Kerry native Cox gave Roscommon the lead for the first time and Niall Kilroy doubled the advantage. Jack McCarron hit back in the 18th minute but scores were hard to come by and Niall Daly’s huge point from outside the 45-metre line was the highlight of the first half. Rory Beggan scored his first free and then Evan McGrath should have found the net for Roscommon, but for a brilliant save by Beggan low to his right. Roscommon goalkeeper Darren O’Malley sored a 45 and Cox added another free either side of another precise free from Beggan. The visitors were 0-6 to 0-4 in arrears after the opening half but still had O’Hanlon and Conor McManus to call upon. The latter replaced Micheál Bannigan at half-time and three minutes later he was fouled by Niall Daly when he was through on goal. Daly got yellow and McManus scored the free. That drew the sides level after Conor McCarthy’s opener and Monaghan scored five of the first six points in the half. Cox had the sole reply for Roscommon but the visitors were rampant. Fintan Kelly gave them a 0-9 to 0-7 lead before Ultan Harney cut the gap in the 51st minute. That Harney score sparked a revival for Roscommon and two quick-fire points from Cox and Kilroy had them back in front with 14 minutes remaining. But Cox and O’Rourke went in quick succession as the game looked to have turned in Monaghan’s favour again. McManus and then Dermot Malone gave Monaghan the lead again. However Ultan Harney was fouled in the penalty area and Smith slotted the kick. McCarron reduced the arrears but five minutes after his arrival on the field O’Hanlon was sent-off when he got involved with Evan McGrath off the ball. There was still time for McManus to score again but Cox and Daly settled it. Scorers for Roscommon: Conor Cox 0-5 (0-5f), Enda Smith 1-1 (1-0 pen), Niall Kilroy 0-2, Darren O’Malley 0-1 (0-1 45), Niall Daly 0-1, Ultan Harney 0-1, Ronan Daly 0-1. Scorers for Monaghan: Conor McManus 0-4 (0-3f), Rory Beggan 0-2 (0-2f), Dessie Ward 0-2, Jack McCarron 0-2 (0-1f), Conor McCarthy 0-1 (0-1f), Fintan Kelly 0-1, Dermot Malone 0-1. 15. Cathal Cregg (Western Gaels). 17. Gary Patterson (Michael Glavey’s) for Devaney (77). 25. O’Hanlon for McCarthy (67). Email “Late Smith penalty seals big win for Roscommon as they halt Monaghan's bright start to 2019”. Feedback on “Late Smith penalty seals big win for Roscommon as they halt Monaghan's bright start to 2019”.